Are you a part of or interested in the growing culture of computer science and information technology? Does neural networking, machine learning and game development invoke excitement and curiosity in you? Are you passionate about creating technology to support human and social good? Then you might want to look closer at Goshen College’s computer science and information technology programs. Graduates have gone on to develop software and websites, work as engineers, and study astrophysics. Others now work for Google and Apple, or have started their own businesses. We are small, but mighty. Our program embraces human-centered computing, computing for the good of humanity and other ecologies. We have courses in accessibility programming, where we create software and hardware for persons with disabilities. We participate in the Association of Computing Machinery’s Computation Competition every October. Last year our team came in 5th at the site, and 101st in the region, and it was only our second year in the contest. Quality, not quantity. Our professor-to-student ratio makes certain you have the most hands-on education possible. We offer real world, hands-on paid internships for our students. 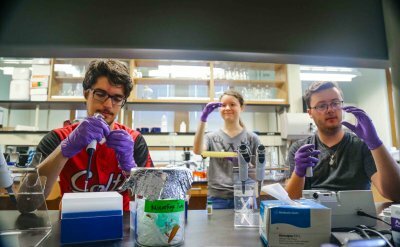 We participate in the college’s Maple Scholars Summer Research Program, where students take on a special research project and work closely with a professor. Women are welcome here! We have a strong female core in computer science and information technology. As a woman, you will have support and enjoy fun activities in our on-campus chapter of Digital Eve. Additionally, we are a member of the National Center for Women in Technology. This organization recognizes and supports women in computer science and information technology through scholarships and other programs. If you are a woman who codes, Goshen College is the place to be! During this year’s international game development event, Global Game Jam, students from Goshen College and community members sought to use their own game-development talents to prove it. 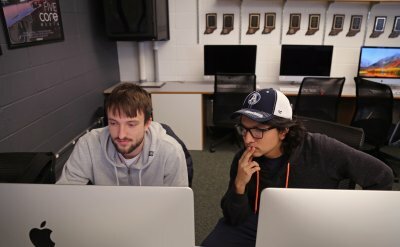 Three Goshen College students are using their knowledge of computer science to bring new, innovative technology to share the history of Goshen, Indiana. Micah Miller-Eshleman, with the help of former GC student Alan Smith, started his own web development business called PixelDance while studying at Goshen College. Jacob Stucky ’06 studied computer science and business. Now he is VP of Software Development at Thycotic, a cybersecurity organization. Ariana Perez Diener, an environmental & marine science major, and Christian Gehman is an environmental science & computer science major, spent their summer studying prairie cattle grazing at Merry Lea. After graduating from Goshen in 2008 with a math and computer science degree, Jason Yoder earned a doctorate at Indiana University Bloomington--and plays for a professional Ultimate Frisbee team, the Indianapolis AlleyCats. Peter Miller, a computer science and applied math major, graduated from Goshen College in 2011. Today, he runs CodePurple, a company that provides on-campus opportunities for students to practice programming. Rachel Smith, a 2001 graduate, combined her interests to create a linguistics website that teaches American English pronunciation.